Seriously, don’t you agree these two projects are cute enough to take the prize? We fell in love with both of these designs. Congratulations, Kim and Emily!! Please watch your inboxes for an email from me with more details about your prize!! There were numerous projects that we all were in love with, and we wanted to give three of those projects kudos for a job well done. More creative genius, right?!! I have to say, we have the best challenge players in the business! Thank you, ladies – your work amazed us and we wanted you to know it! That’s it for today, friends!! 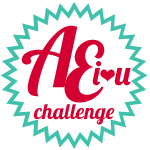 We’ll have a brand spankin’ new challenge for you, but we’re doing this a little bit differently for the November AEI♥U Challenge! We’ll be collaborating with a special holiday event that I think you all are going to love!! But because of that, the new challenge won’t go live until November 2nd!! We hope you’ll drop by then to check out the new challenge and play along with us!! Until then, thanks so much for stopping by! Eek, you've made my Halloween!! LOL I can't believe I won with so many outstanding entries. Congrats to Kim, Jinny, Joyce and Therese, too! Thank you, Avery Elle!! Thanks so much! What a way to start me weekend :). Congrats to all, I find such inspiration from all the wonderful submissions to these challenges! These cards are so wonderful, congrats to the winners and I am so happy that my card was chosen as runner up, thanks heaps! A big congrats to Kim and Emily, and thanks so much for the shout-out!